How do large corporations encourage their senior managers to become more entrepreneurial? This is a key question which is seldom addressed in mainstream entrepreneurship studies. 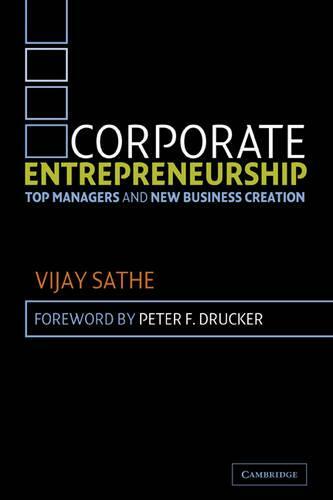 Professor Sathe has written this study based on hundreds of hours of interviews with senior managers to help understand why some organizations and some top managers are better than others in fostering entrepreneurship leading to successful new business growth. Corporate Entrepreneurship explores the real world of top managers in a systematic and comprehensive way, examining business realities, the management culture, the corporate philosophy, the organizational politics, the personalities and the personal agendas of the people at the top. The book offers both a theory of corporate entrepreneurship and practical advice on how to manage it better. An interesting and valuable contribution to the literature on strategic management, this is a book that will appeal to graduate students, researchers and reflective practitioners. 'Corporate Entrepreneurship is essential reading for practitioners, researchers, and MBA students interested in new business creation. We have a rare opportunity to learn from 'what went right' as well as 'what went wrong' in the real world. We also learn from the real-life stories and direct quotations of top managers at large corporations as well as the writings of academic giants of leading business schools around the world. Most importantly, we learn from the author's insights into 'how to do' as well as 'how to see' the new business creation process. Without new business creation there is no future - for corporations as well as for our society.' Hirotaka Takeuchi, Graduate School of International Corporate Strategy Hitotsubashi University, Japan, and co-author of Can Japan Compete? "Corporate Entrepreneurship is essential reading for practitioners, researchers, and MBA students interested in new business creation. We have a rare opportunity to learn from 'what went right' as well as 'what went wrong' in the real world. We also learn from the real-life stories and direct quotations of top managers at large corporations as well as the writings of academic giants of leading business schools around the world. Most importantly, we learn from the author's insights into 'how to do' as well as 'how to see' the new business creation process. Without new business creation there is no futureefor corporations as well as for our society." Hirotaka Takeuchi, Professor and Dean, Graduate School of International Corporate Strategy, Hitotsubashi University, Japan, and coauthor of Can Japan Compete?